Provides a user interface for indicating that a control on a form has an error associated with it. Why use a ErrorProvider control? Use the ErrorProvider if you want to notify the user that there is an input error by flashing an icon next to the input control. You can use a single ErrorProvider for multiple controls. In the case where you wish to display different icons or styles, you will need to use multiple ErrorProvider controls. Use this property to change the icon used to indicate an error. This property controls the rate in milliseconds at which the error icon blinks. Use this property to increase or decrease the blink rate of the icon. Note: 1000 milliseconds = 1 sec. This property controls whether the error icon blinks when an error is set. Blinks when the icon is already displayed and a new error string is set for the control. Always blinks when the error icon is first displayed, or when an error description string is set for the control and the error icon is already displayed. Never blinks the error icon. This method sets the error description string for the specified control. Use the SetError method to display the error icon next to the target control and display a specified error message when the user hovers the mouse over the error icon. To clear an error message, pass an empty string to the method, using the same control as a parameter. This method sets the location where the error icon should be placed in relation to the control. Note: You have to set the alignment for each individual control. Note: You can set also set the Icon Alignment in the designer by setting the target control’s “IconAlignment on errorprovider1” property. The icon appears aligned with the top of the control and to the left of the control. The icon appears aligned with the top of the control and to the right of the control. The icon appears aligned with the middle of the control and the left of the control. The icon appears aligned with the middle of the control and the right of the control. The icon appears aligned with the bottom of the control and the left of the control. The icon appears aligned with the bottom of the control and the right of the control. 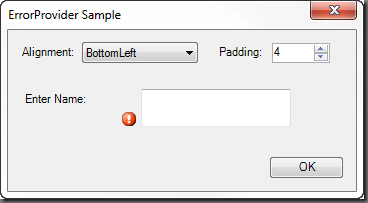 Sets the amount of extra space left between the specified control and the error icon. Note: You have to set the padding for each individual control. Note: You can set also set the Icon Padding in the designer by setting the target control’s “IconPadding on errorprovider1” property. Download the ErrorProvider Sample from our Downloads section. Hi, This is great information however I do have a snag. The errorprovider does what this article says but it doesn’t cover one aspect. This is that I have other action under the OK button. When the errorprovider kicks in the script will continue with the other actions. I would of expected the errorprovider to exit until a valid entry is made. Please see the Validating the Form blog series. It should help answer your question.